A few safety tips from the U.S. Consumer Product Safety Commission can protect children who plan to go trick-or-treating this Halloween. Treats: Warn children not to eat any treats before an adult has carefully examined them for evidence of tampering. Flame Resistant Costumes: When purchasing a costume, masks, beards, and wigs, look for the label Flame Resistant. Although this label does not mean these items won't catch fire, it does indicate the items will resist burning and should extinguish quickly once removed from the ignition source. To minimize the risk of contact with candles or other sources of ignition, avoid costumes made with flimsy materials and outfits with big, baggy sleeves or billowing skirts. 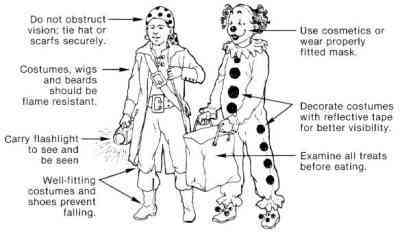 Costume Designs: Purchase or make costumes that are light and bright enough to be clearly visible to motorists. Children should wear well-fitting, sturdy shoes . Mother' s high heels are not a good idea for safe walking. Pedestrian Safety: Young children should always be accompanied by an adult or an older, responsible child. All children should WALK, not run from house to house and use the sidewalk if available, rather than walk in the street. Children should be cautioned against running out from between parked cars, or across lawns and yards where ornaments, furniture, or clotheslines present dangers. Choosing Safe Houses: Children should go only to homes where the residents are known and have outside lights on as a sign of welcome. **This document was reprinted with permission from the Consumer Product Safety Commission.